An aviation career is rewarding but not without risk. So let's say that you've graduated from high school or college and want to pursue a career in aviation. You want to "slip the surly bonds of earth" and spend your days with your head in the clouds. Well hold on just a second there, pardner. I don't want to crush your dreams, kid, but I'd be remiss to not be brutally honest about the career field you are hoping to enter. Let's explore for a few moments some short and long term trends in aviation that you need to consider before chasing this particular dream. As I mentioned in an earlier article in this series, there's never been a better time than now to get into commercial aviation jobs-wise. There are huge numbers of pilots retiring from the largest major airlines who need to be replaced in the next five to ten years. These pilots are mostly being replaced by pilots who are currently flying for regional carriers and to a lesser extent the military. A huge vacuum is forming at the regional carriers who for various reasons are having trouble replacing those pilots with new hires. This means job opportunities for pilots who have or are willing to get their ratings and hours. I recently attended an aviation job fair and the competition for new pilots is fierce. Regional airlines are boosting pay, offering signing bonuses and even offering to pay for crash pads for commuting pilots, all unheard of for years. Now for the reality check. You have two routes into an airline cockpit: military or civilian. Both routes will get you where you want to go but they both have high costs, one in time and the other in money. In years gone by, the majority of airline pilots came from the military. That is no longer even remotely true. While I don't have the exact numbers, the majority of pilots being hired by major airlines now have only a civilian background. Reductions in the size of the military along with lengthened pilot training commitments are two of the biggest reasons. The Air Force requires a ten year service commitment in exchange for pilot training while the Navy has an eight year commitment. The Coasties, Army and Marines have similar commitments. These commitments don't start until after successful completion of flight training which takes about a year. Leaving the service on the day your commitment expires might not be completely realistic as well as you'll probably incur other service commitments for things like aircraft commander upgrade or training like fighter weapons school. The military spends a ton of money on its pilots and wants to get a return on that investment. You also have to hope that the airlines are hiring when you are ready to leave the service. This was the route I took, spending a total of 10 years on active duty (the commitment was six years when I joined). On the bright side, when you leave the military you will have the hours and experience to apply directly to a major airline. If this is the route you wish to pursue and haven't yet graduated from high school, your choices for commissioning are through either an ROTC program at a college, or one of the service academies such as USAFA, Annapolis or West Point. ROTC scholarships are available and the service academies are free. Upon completion, you will have a college degree and be commissioned as an officer. But getting into these programs is highly competitive and even then you are not guaranteed a pilot training slot. You must compete for those as well. If you already have a college degree, you can join the military and be commissioned through an officer training program such as the Air Force's OTS or the Navy's OCS. This program was memorialized in the movie An Officer and a Gentleman. From there you would go to pilot training. This was my route. I had a degree and joined the Air Force after college (but never dated Debra Winger). If you get selected for pilot training you will undergo a very intensive but comprehensive training course in advanced technology aircraft. Your training will involve all aspects of contact and instrument flying for starters. Should you perform well enough to be selected for a tactical aircraft, you will also be trained in formation flying. Once you graduate from a pilot training course you will be awarded your wings and then proceed on to your mission aircraft which may involve up to another year of mission training and qualification. The training is fast and intense and offers very little tolerance for regression. Every simulator session and ride in the airplane is graded. Pilots who experience difficulties during the program are given some remedial training, but once the extra training has been expended, a quick dismissal from the program can be expected for pilots who can't keep up with the syllabus. When I was an undergraduate pilot training instructor in the Air Force, three busted rides in the airplane was all it took to get a ticket home. Taking the civilian route will likely get you into an airline cockpit in less time than the military, but it is going to cost you a ton of money to get the ratings and hours to qualify for a job. The FAA recently started requiring all pilots hoping to fly for a commercial carrier to have a rating known as an airline transport rating or ATP. Here's the problem. You'll need 1500 hours of time to qualify for this rating. That number is reduced to 1000 hours if you graduate from an accredited aviation school. What kind of money? A quick internet search came back with numbers like five to nine thousand dollars for just a private pilot's license which only qualifies you to rent a plane to buzz around. Getting the full panoply of ratings that will allow you to start on your career will set you back something on the order of 60 to 80 thousand dollars. After spending that kind of money you will still have to flight instruct or do another entry level flying job such as banner tow to build the 1000 (or 1500) hours you will need for your ATP. Simply purchasing those hours is not realistic at $100-$120 per hour airplane rental costs. No matter how you slice it, it will be expensive. But if you're willing to take on the debt, there's probably a job waiting for you. And while the pay at regional airlines is famously low, it is going up as regionals are engaged in a bidding war for the dwindling number of available pilots. Another difference in taking the civilian route is that you will end up being the architect of your own career more so than the military route. You have to decide which aviation school you will attend, whether to take out loans or work a day job while pursuing your career and which flying jobs to take. Deciding between flying jobs such as corporate, regionals or night freight are some of the decisions that await you on your path to the majors. My advice is to seek out mentors who are working pilots and can advise you on the best path to take. I took the military path and as a result would probably not be able to offer meaningful specific advice to someone in the civilian pipeline. But seek out someone who took the path you are contemplating. There are many aviation internet forums available where pilots like to hang out and many are willing to offer advice. And you will need advice. There are dozens of schools all promising a path to an airline seat and all willing to take your money. Caveat emptor is the rule when vetting flying training programs. So things look rosy for the short term, but what about the long term career outlook? That is an excellent question. If you are say, 20 years old and hoping to begin your career in aviation, you are planning on a career lasting 45 years (more if they raise the retirement age past 65). We've all heard about drones and Google's driverless cars, but what about airplanes? Will there ever be a day when people line up to get on an airplane that has no pilot? The answer is unequivocally yes. There will eventually be pilotless airliners. The only question is when. Balderdash and poppycock you say? Consider this: What would have been the reaction if you'd asked a railway passenger back in, say, 1890 if there would ever be engineer-less trains. I'm guessing the reaction would have been similar and yet we routinely get on trains with no humans driving and think nothing of it. But, you retort, those are small applications such as airport transports on closed systems. Subways, passenger and freight trains still have human drivers! And you are absolutely right, but how many humans are driving those trains? A fraction of the number it used to take. And that's the key. Simply look at the trend of how many humans it has taken to fly an airliner over the years. In the immediate postwar era it took four: two pilots, a navigator and an engineer. Navigators were quickly eliminated by INS systems and the engineers were next to go being replaced by ECAM systems. Now we all love first officers (well, most of them), but airline managements, maybe not so much. Current research at places like DARPA is aimed at perfecting robots to eliminate first officers. And just eliminating copilots will slash the need for pilots by 50% overnight. Again the question isn't so much of if but rather of when. Estimates vary, but if you are just now embarking on a career that you hope will last for four decades, you will likely finish your career as a system monitor in the front of an airplane (or perhaps a flight center data linked to an airplane) if you have a job at all. That's not what I'd call great aspects for career advancement or seniority. Food for thought. Still not convinced? Take a look at this video. This post concludes my series on career advice for pilots. I'll be the first to admit that even though I've had a charmed career and love flying, I'm not sure I can recommend a flying career without some reservations, especially to a bright kid who has other options. 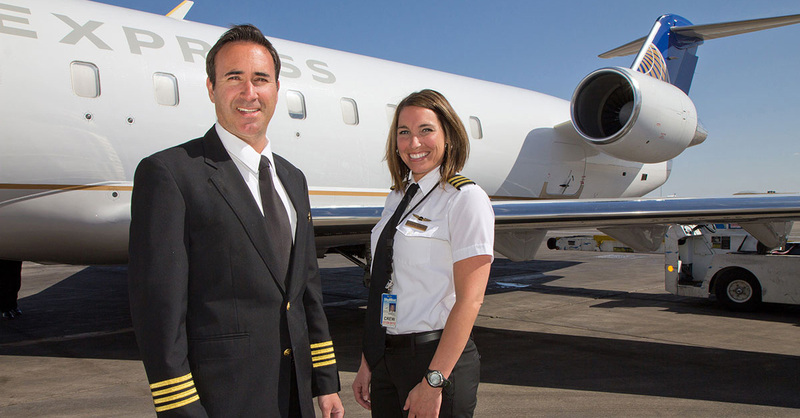 If you're already flying for a living, it's a great time to be in the profession. If you are thinking about starting on a career in aviation, some deep soul searching is in order. This profession has a knack for crushing souls and dreams, but should you pull the trigger and go for it, the view from your office window will be second to none. Good luck! And if you have any questions at all about your own situation, leave me a message in the comments. I'm here for you! Parts 1 and 2 of the series are here and here. I completely understand that the debt you're piling up seems daunting. It's crazy how much this all costs, but if you get your ratings and hours you will definitely have a job. Commuter airlines are screaming for pilots and are offering huge signing bonuses to get new people. I've seen some airlines offering up to $15,000. It may be more. As I mentioned in the blog, it is a great time to be getting into aviation partly because the barriers you face are so high...hugh debt scares many off, so those who make it are in demand. As far as the Guard, I highly recommend it. The military offers many education assistance programs. Even if you don't get offered a flying slot right away I think that it is still a good deal. A close friend of mine started with the AF Reserves as a loadmaster on a C-5 and eventually the unit sent her to pilot training. She now flies a 767 for Delta. So it sounds to me like you're on track. Just keep on keeping on and you will achieve your dream. Tons of retirements means there will be lots of opportunity. Good luck!